Concrete dentist Sharon Feller doesn’t necessarily look like she can take a hit. But she’s discovered a new hobby that leaves her bruised—and exhilarated—every time she does it. Feller, 44, owner of Concrete Dental, has been named to the “Overbearings,” one of the teams that comprise the Skagit Valley Roller Derby. Her derby name is “Fill-us Driller” (get it?). And she can’t get enough of the fast-paced sport. “I got better and better, and I did it,” said Feller, who passed her test and attended her first league meeting in February. 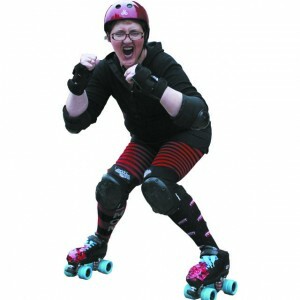 Skagit Valley Roller Derby is the brainchild of Shannon Davis-Tolbert, who lives in Mill Creek. You might recognize Davis-Tolbert’s name; she’s the one who helped bring bowling back to Sedro-Woolley. Davis-Tolbert said she got hooked on roller derby after seeing the Jet City Rollergirls in Snohomish County. “A friend and I thought we’d give it a shot. I fell in love with it the second I put skates on. I could barely stand, but I fell in love with it,” she said. Davis-Tolbert—or “Biggie,” as she’s known to her teammates—is funding the roller derby effort out of her own pocket, but is planning fundraisers to help grow and support the sport in Skagit County. 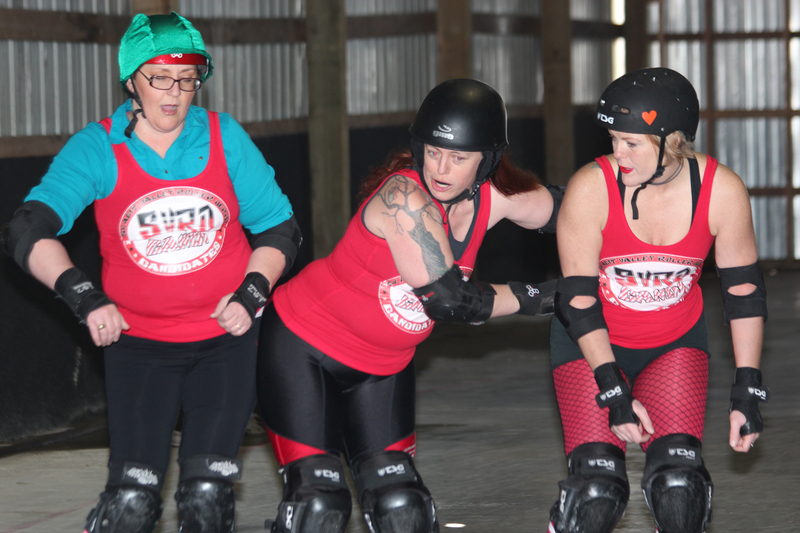 In the old Oso warehouse, a group of rollergirls gathered to practice March 3. Wearing helmets, knee and elbow pads, wrist guards, and mouth guards (Feller made her own), they skated the concrete flat track at varying speeds, practicing their moves and bumps. Even Feller’s “bum savers”—hip and tailbone protectors—don’t save her from getting banged up during practice. But that doesn’t bother her. Show up: Info Jamborees, first Sunday each month, 2 p.m. Sat., noon to 2 p.m. Sun., 6 to 8 p.m. Mon., 6 to 8 p.m. Thur., 1 to 3 p.m. Concrete dentist Sharon Feller, a.k.a. 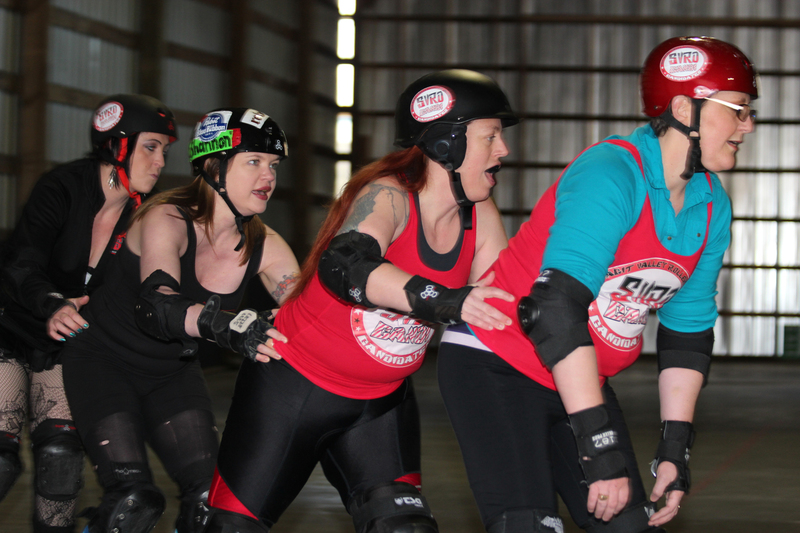 “Fill-us Driller” (left) gets bumped by fellow Skagit Valley Roller Derby girl Lisa Swanson of Sedro-Woolley during a practice session March 3. At right is Michelle Rhodes, also from Sedro-Woolley. Concrete dentist Sharon Feller, a.k.a. 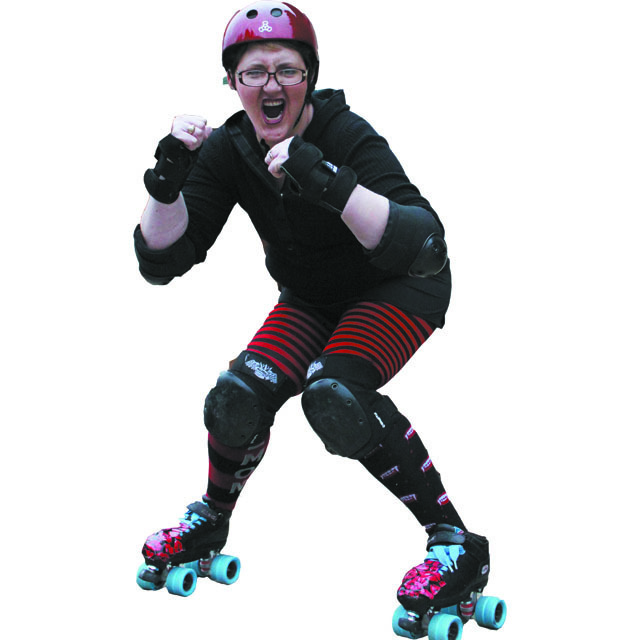 “Fill-us Driller,” is ready to take on the competition as a Skagit Valley Roller Girl.